In a sense, the band's name says it all. "Ban-san-gu" (band sounds good) is apparently the lapidary formula which Brazilian percussion legend Airto Moreira uses to describe the way a band sounds when everyone in it is working well together. And, on Monday night in Ronnie's this band, with every member (listed below) playing his or her heart out, sounded very good indeed. And forget any thought that these elite players who have spent their thousands of hours in studios might be jaded, might have their ways of coasting, maybe even of disengaging. 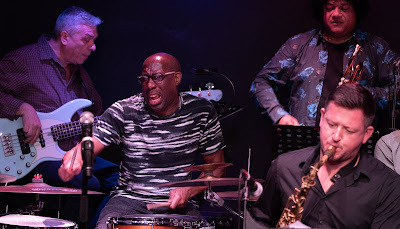 The urgency of the whole enterprise and the commitment to it, were there to be heard, and to be seen too: keeping an eye on the facial expression of drummer Rod Youngs was enough to get a sense throughout the evening that every intervention, every note was of vital importance. This really is an elite band. The expression "if you want something done, ask a busy person" comes to mind. These are the London players (I'm tempted to say 'metropolitan elite') who are permanently in demand, and the quality they bring to everything they do is palpable. There were a couple of core members on tour in North America: bassist Davide Mantovani (currently with Lisa Stansfield) and Giorgio Serci (currently with Basia), but their replacements were also top-drawer players who slotted in easily in this company. On bass Laurence Cottle brought lively lines, perfect balance, the occasional finger-popping solo, and also a sassy arrangement of Tower of Power's What is Hip featuring the excellent Claire Martin, while on guitar Guille Hill had solo features where the sheer presence of his sound and his sense of drama and narrative instantly drew the whole audience in. Oli Rockberger's characterful Randy Newman-ish songs had the benefit of great arrangements by the presiding genius and band director Paul Booth. A particular joy was this band's saxophone section in which only players of quite astonishing ability get the call. 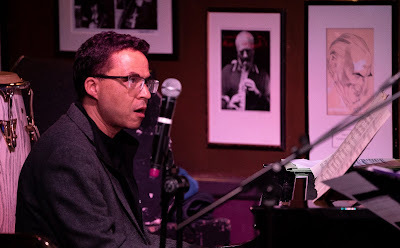 In her review of the band's CD, LJN writer Jane Mann referred to a "driving, joyous quality", and that was very much in evidence on Monday night. A highlight was Curralau Cool by Alex Wilson, who had come over from Switzerland especially for this gig. As ever he combined poetry and beauty of sound with how-many-hands-has-he-got virtuosity. The arrangements are wonderfully characterful. Kevin Robinson's reggae-inspired Walk On By is a gem. The themes of elite playing quality and busy people were also there in the support band. Pianist Rob Barron (who has another trio album on the way, I was told) played with two stalwarts from the John Wilson Orchestra, bassist Jeremy Brown and drummer Matt Skelton. The three brought languor and lyricism to Johnny Mandel's A Time for Love, and the perfect contrast of velocity and joy to Mike LeDonne's Emergence, a contrafact on Love for Sale. This was an evening to be reminded what astonishing quality and bench-strength there is among the players in London. We really don't celebrate it enough. Wow, I saw them in Margate at a festival & they may have been the best thing of the weekend, but this sounds even better! Gran abrazo y alegría para el gran guitarrista Guille Hill. Desde Aquí en Montevideo. Te lo mereces Guille!!! I was at the table just in front of saxes and it was WAOUHHHH ! ! !